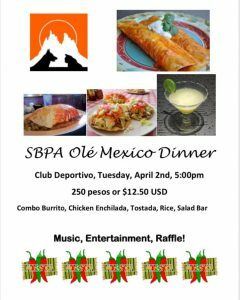 Enjoy a delicious Mexican dinner at SBPA’s Olé Mexico dinner on Tuesday, April 2 at 5:00pm at Club Deportivo. Dinner will be combo burrito, chicken enchilada, tostada, rice and salad bar. There will be Music, Entertainment and a Raffle. The cost is 250 pesos or $12.50 USD. Buy your tickets at the Altered Tails Book Shoppe or in front of CIBanco most mornings. Did you know that every two tickets purchased will pay for one spay / nueter surgery and related medical supplies and vaccinations?